As already discussed in this recent post, Pure Storage announced new products and services at their first user conference, Pure //Accelerate 2o16. 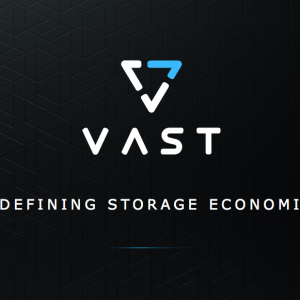 The announcements included; FlashBlade, a scale-out all-flash NAS & object platform; FlashArray //m10, a new entry-level block-storage device and upgrades to FlashStack, Pure’s converged infrastructure solutions. This post will discuss FlashBlade. 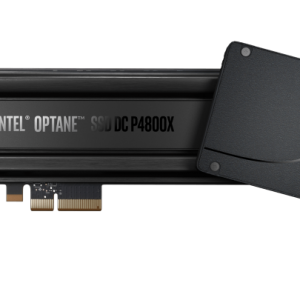 There has already been a lot of discussion about FlashBlade, some of which you can find at my dedicated page for the //Accelerate 2016 event. 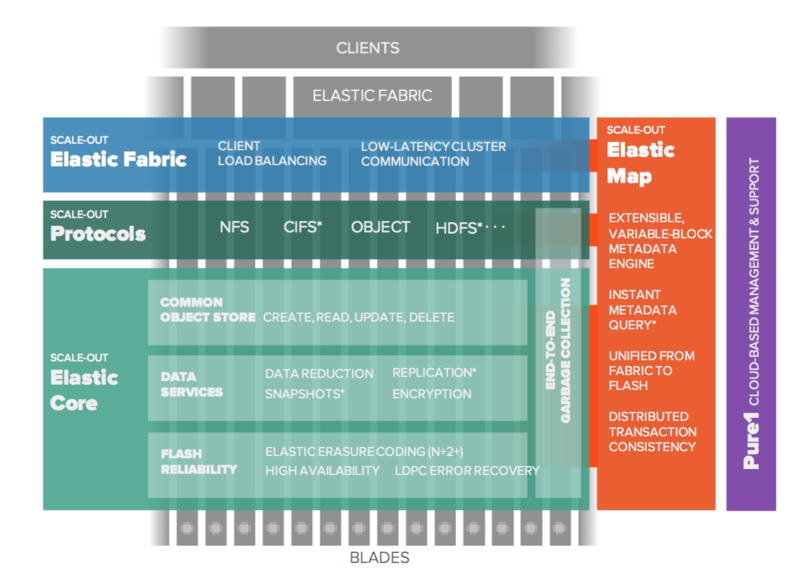 FlashBlade is an entirely new product line, billed as a cloud-scale data platform, but essentially a scale-out NAS & object store. 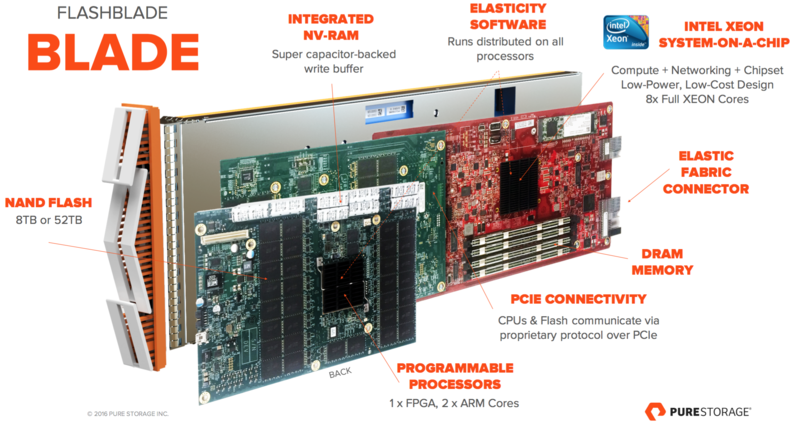 As you would expect, the system is based entirely on flash storage and in this instance, Pure has build their own storage and compute blades that house a custom daughter board with NAND flash, integrated NVRAM and FPGA with ARM cores. 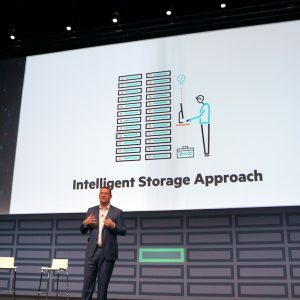 This architecture is a step away from the systems Pure has developed previously, which used standard Solid State Disks (SSDs) to deliver scale-up solutions based on dual controllers and disk shelves. A single 4U FlashBlade chassis can accommodate up to 15 blades with either 8TB or 52TB of onboard flash for a total of 1.6PB (usable) capacity. At the back end, multiple blades are connected together through an interface called the “Elastic Fabric Connector” that delivers up to 15GB/s between blades. Multiple chassis can be connected together using 40GbE Ethernet. Currently protocol support is limited to NFS (V3) and Object, with future plans to support SMB and HDFS. Data protection is based on erasure coding (N+2 scheme), with the underlying data storage mechanism based on an object store. The move to custom NAND is an interesting decision, one we discussed with the technical team at Pure during the //Accelerate event. 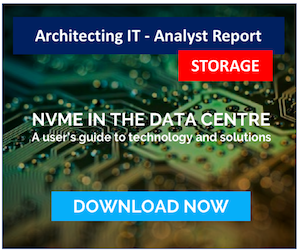 It appears that there was always a desire to write directly to NAND, either by managing the controller on an SSD or by building products that used NAND directly. As part of the test and design phase, Pure used 16,000 NAND chips or around 20PB of capacity to get the product to the alpha phase. Building a custom NAND module provides a number of benefits, like being able to dispense with SAS expanders, interconnectors and other components that are used to write to standard SSDs. Pure claims that failure rates in NAND are very low. The failure rate of SSDs is something that has been discussed in the past. At the very first presentation by Pure Storage at Tech Field Day 8, the company claimed to have seen very little or no actual SSD failures. When I discussed this with John Colgrove (aka Coz) last year, he indicated that failures do occur, but typically are controller issues and returned drives can be re-instated for lab use. Of course Pure are now in charge of the NAND controller in its entirety and so should be able to manage failures much more effectively. FlashBlade is very much a version 1 product. At this stage there’s only support for NFSv3 (due to customer demand), with future protocol support coming later. The product won’t be available for Directed Availability until later this year, (2H2016), with GA some time after that. So, that provides some breathing room to add missing features and functionality. Although the product is being touted as scale-out, it’s not yet clear to me how features like de-duplication will be handled on a multiple-chassis basis or whether de-dupe will simply be within a single chassis or blade. Some of these details were discussed during //Accelerate, however there’s a lot here to digest, which will no doubt become more clear over the coming months. We’ve discussed the technology at length, so what are the use cases for this platform? 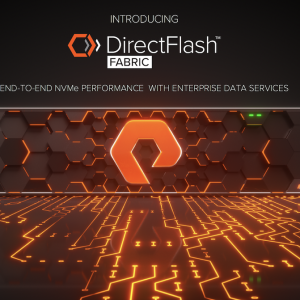 There are few, if any, all-flash NAS and object store platforms, except perhaps NetApp AFF for NAS and object store SDS platforms using all-flash hardware. As a result the use cases are not based on your standard file & print environments, but at unstructured data solutions that need low latency and high throughput capabilities. This includes the examples Pure has provided, such as chip simulations, automotive design or high-performance consumer websites. In terms of the competition, the unsaid targets will be EMC Isilon and NetApp, and in particular their high-end solutions customers. It would be easy to criticise Pure for being a one-trick pony with only a single product line, however in reality FlashBlade has been in development for some time as a separate product line (almost like a startup within a startup) and expands the available market for all-flash products. There was even a rumour that a third product could be in the works, although no details were given (but weren’t denied). There’s definitely a cultural approach within the company to try and retain their startup roots, while bringing new products to market to expand their addressable market. At the same time, some of the most important features (like consistent user interfaces) are not being overlooked. This makes Pure a very different company from, for example, the likes of EMC, which is very much a portfolio holding organisation of acquired technology. I’m looking forward to seeing more of FlashBlade and being able to fill in some of the gaps (I have lots more background notes for future posts) as well hearing about future product development – which presumably will be announced at Pure //Accelerate 2017. Copyright (c) 2009-2016 – Chris M Evans, first published on http://blog.architecting.it, do not reproduce without permission. Images used inline in this post are copyright Pure Storage. Disclaimer: I was personally invited to attend both Pure //Accelerate 2016 and Storage Field Day 9, with the event teams covering my travel and accommodation costs. However I was not compensated for my time. I am not required to blog on any content; blog posts are not edited or reviewed by the presenters or the respective companies prior to publication.